Just in time for the return of football season, fall weather, and dove hunting, channel catfish will make their return to Community Fishing Program waters. Mark the week of Sept. 17 for the return of Mr. Whiskers. See the new Community stocking schedule. For rainbow trout, water temperatures in the low- to high-50s still favor trout-stocked streams in the high country. Better water quality in these streams should also make fish more active as long as flows are not high due to monsoon rains. See this week’s stockings below for other trout hot spots — we also stocked some big, native Gila trout into Goldwater Lake. We also had a report from Big Lake that cutthroat trout are shallow, spawning and active and rainbow trout are worth targeting from a boat. We’re entering a new moon phase, which will make using submersible lights at night extremely effective. Night fishing should be great at hot spots such as Lake Pleasant, Lake Mead, Lake Mohave and Lake Powell. At some desert impoundments such as Roosevelt and Bartlett lakes, reaction baits (crankbaits, jerkbaits, spinner baits) can be a good early morning option. There are reports that at Canyon Lake (water temperature around 81 degrees), water quality has improved and fishing has picked up significantly with plastics on Texas and dropshot rigs being the most effective techniques. 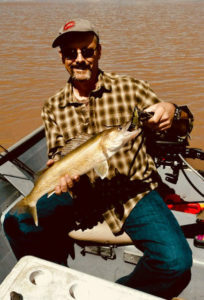 Rainbow trout: Tonto Creek (58-62 degrees), Mingus Lake (62), Fain Lake (68), Show Low Creek, Dogtown Reservoir (74), Ashurst Lake (68), Oak Creek, Frances Short Pond (68), Goldwater Lake (73), Colorado River. Gila trout: Goldwater Lake (73). Stephan W., along with wife Amanda, caught this 23-inch walleye about 10 a.m. on Saturday, Sept. 1.